Sandwiches are a magical food. They’re delicious and handy. Yet they come in every variety possible, limited only by your imagination. I consider myself a sandwich connoisseur of sorts and am always crafting new ones for lunch. This one was inspired by one I eat frequently at a local restaurant. I took my own spin on it and was pleased with the results enough to share the recipe. Chipotle ranch is slowly growing in popularity. It’s nothing new, but it’s certainly hit it big over the past decade thanks to its pairing with sandwiches and onion rings. This particular chicken sandwich is relatively smooth thanks to the addition of french fries, however don’t think that that means it’s bland. Chipotle ranch and cheddar are an awesome combination, and form something with formidable tang, without being too in your face. Your choice of chicken depends on personal preference, but I recommend using breaded cutlets since the breading adds some more flavor. 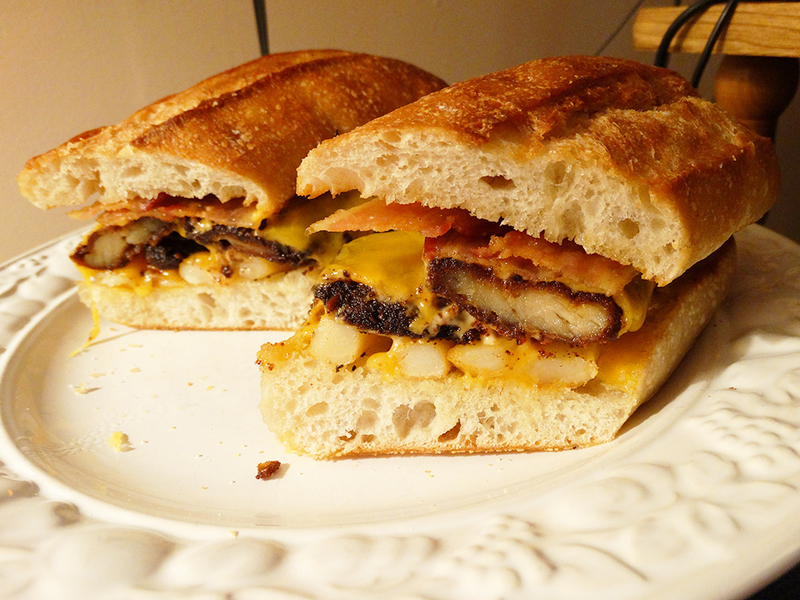 Best of all, this sandwich in general can be made with mostly things lying around the house. Nothing too luxurious. That makes it perfect for throwing together as a quick lunch or even dinner! If chicken and fries require heating, do so in the oven for about 5 minutes or longer depending on how cold they were. Cut roll in half and spread a thin layer of butter (optional) on both sides. Set oven to broil, and place roll halves in oven on a baking tray for approximately 1 minute, or until lightly toasted. Remove toasted bread. Salt and pepper French fries to flavor and place them onto the bottom half of your roll. Spread the chipotle dressing onto your chicken breasts and place them on top of the French fries layer of your sandwich. Place a layer of the cheese on top of the chicken. Return this half of sandwich to the oven on a baking tray for 30 seconds to 1 minute, checking frequently to ensure cheese does not burn. When cheese has melted and become gooey, remove from oven again. Place bacon slices on top of cheese, add remaining top of the roll and press down firmly. Cut sandwich diagonally (classy!) and enjoy. Posted on September 3, 2014, in Etcetera and tagged bacon, chicken, chipotle, easy, french fries, recipes, sandwich. Bookmark the permalink. Leave a comment.